Situated in Wadi Rum, this tentalow is 2.9 mi (4.7 km) from Lawrence's Spring and 3.1 mi (5 km) from Khazali Canyon. Wadi Rum Visitor Center is 8.6 mi (13.9 km) away. 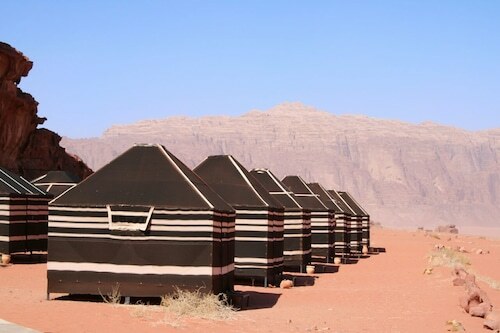 Situated in the historical district, this tentalow is 11.7 mi (18.9 km) from Wadi Rum Visitor Center and within 20 mi (32 km) of Lawrence's Spring and Wadi Rum Protected Area. Khazali Canyon and Mushroom Rock are also within 25 mi (40 km). 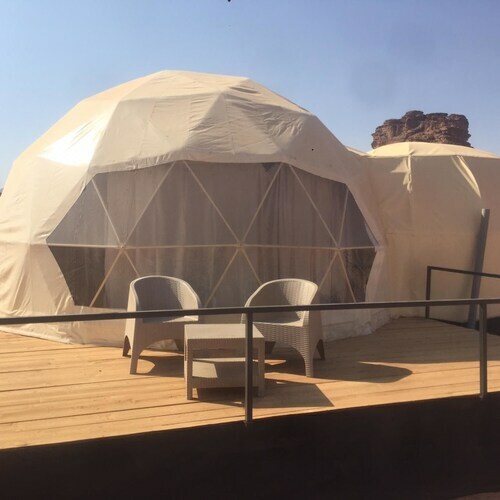 Situated in Wadi Rum, this tentalow is 7.4 mi (12 km) from Wadi Rum Visitor Center and within 16 mi (25 km) of Wadi Rum Protected Area and Lawrence's Spring. Khazali Canyon and Mushroom Rock are also within 20 mi (32 km). Situated in Wadi Rum, this tentalow is 0.3 mi (0.5 km) from Mushroom Rock and within 3 mi (5 km) of Lawrence's Spring and Khazali Canyon. 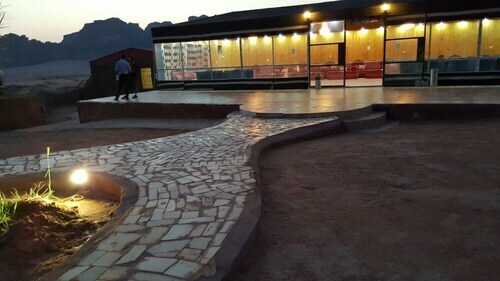 Wadi Rum Visitor Center is 8.3 mi (13.4 km) away. Situated in the mountains, this tentalow is 0.1 mi (0.1 km) from Khazali Canyon and 2.2 mi (3.5 km) from Wadi Rum Protected Area. Lawrence's Spring is 2.2 mi (3.5 km) away. 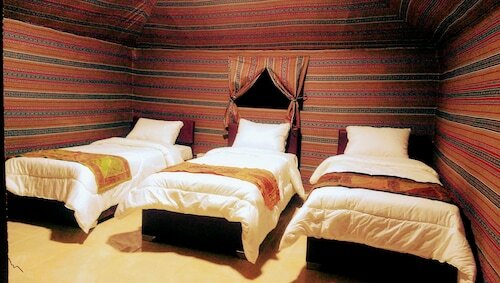 Situated in Wadi Rum, this tentalow is within 3 mi (5 km) of Wadi Rum Protected Area, Lawrence's Spring, and Khazali Canyon. Mushroom Rock is 3 mi (4.8 km) away. Situated in a national park, this tentalow is 2.5 mi (4.1 km) from Wadi Rum Protected Area and within 6 mi (10 km) of Lawrence's Spring and Khazali Canyon. Wadi Rum Visitor Center and Mushroom Rock are also within 12 mi (20 km). 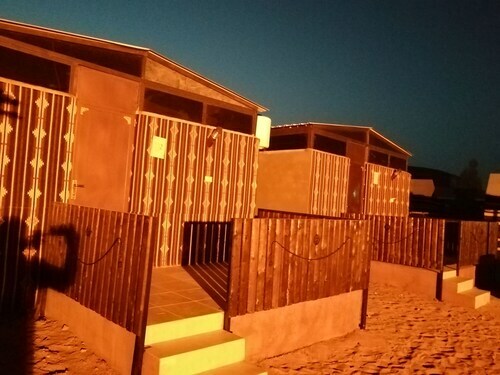 Situated in Aqaba, this tentalow is within 1 mi (2 km) of Sharif Hussein bin Ali Mosque and Port of Aqaba. Palm Beach and Early Islamic Ayla are also within 15 minutes. Situated in the mountains, this tentalow is 10.3 mi (16.6 km) from Wadi Rum Visitor Center and within 20 mi (32 km) of Lawrence's Spring and Khazali Canyon. Mushroom Rock is 19 mi (30.5 km) away. 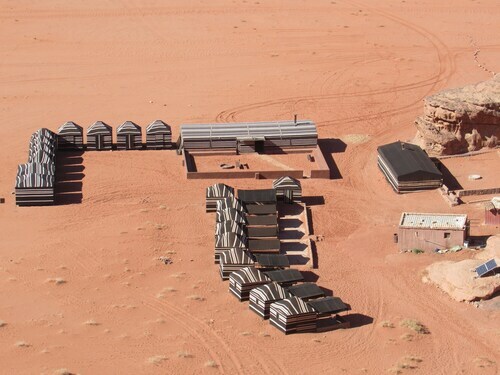 Situated in Wadi Rum, this tentalow is 6.4 mi (10.4 km) from Wadi Rum Visitor Center and within 16 mi (25 km) of Wadi Rum Protected Area and Lawrence's Spring. Khazali Canyon and Mushroom Rock are also within 16 mi (25 km). 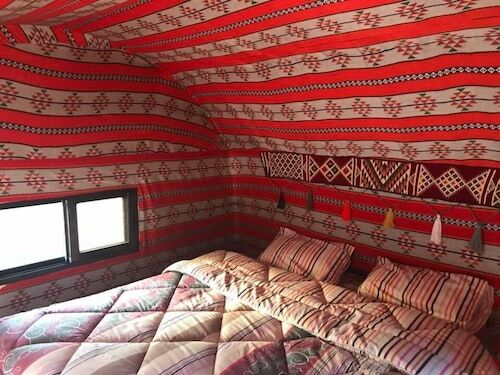 This family-friendly Wadi Rum tentalow is located in a rural location, 1.6 mi (2.6 km) from Lawrence's Spring, and within 6 mi (10 km) of Wadi Rum Visitor Center and Wadi Rum Protected Area. Khazali Canyon and Mushroom Rock are also within 6 mi (10 km). 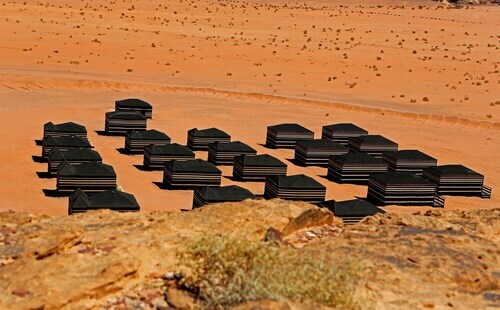 Situated in Wadi Rum, this tentalow is 6.3 mi (10.1 km) from Wadi Rum Visitor Center and 12.4 mi (20 km) from Lawrence's Spring. Wadi Rum Protected Area and Khazali Canyon are also within 16 mi (25 km). There are a few things we can think of that are on the list of any intrepid explorer: climbing a few mountains, scuba diving a few reefs, and of course, going on a safari. Getting up close and personal—but not too personal—with some of the world’s most weird and wonderful animals should be on the bucket list of anyone who likes the Great Outdoors. But just because you want to get in touch with nature doesn’t mean you have to sleep like a wild animal. We’re sure you’ve heard of glamping, and maybe even tried it. 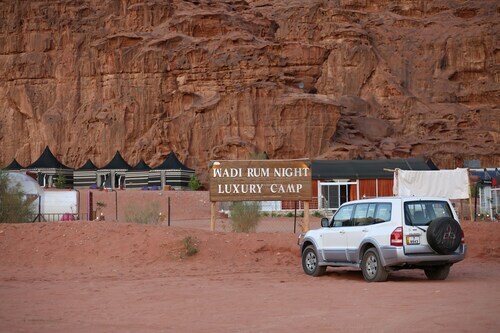 If not, then a Wadi Rum safari tentalow is an incredible way to start. If you have, we’re sure you’ve never done it like this. What even is a tentalow? We’re glad you asked. These luxury tents are the middle ground between camping and hotels, with everything you love from each. You’ll wake up to a cool breeze and chirping birds as if you’re roughing it, but find yourself on a plush, pillowtop bed. You’ll have the stunning, uninterrupted views of a wilderness outpost, but still start your day with a nice, warm shower. And forget cooking things over an open fire—with a tentalow, it’s all about gourmet meals and hot brekkie. It’s amped-up camping. It’s over-the-top tenting. 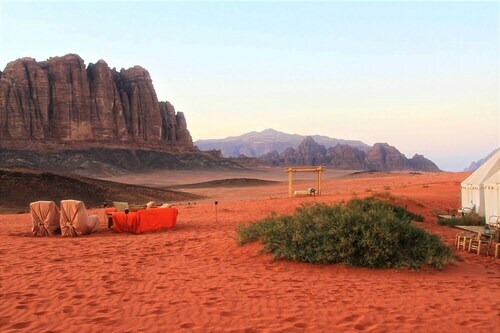 We don’t know how else to say it: Luxury camping in Wadi Rum is unrivalled. Ready to take a walk on the wild side? 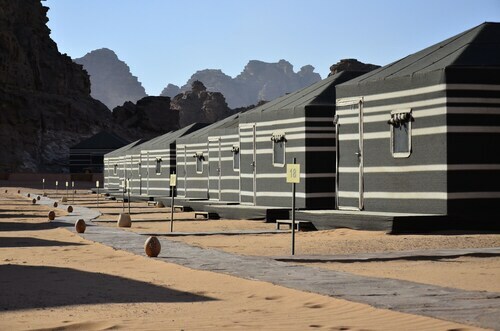 You’ll find everything you need to plan a glam camping trip to Wadi Rum right here at Wotif. You can leave your sleeping bag and billycan at home for this one. We got this. 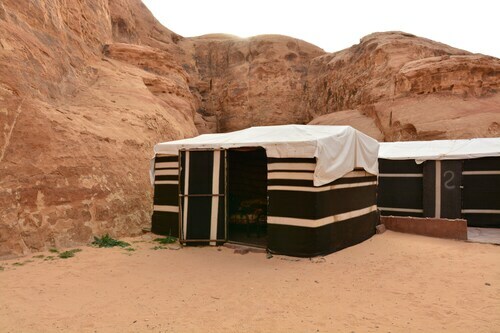 Situated in Wadi Rum, this campground is 2.4 mi (3.9 km) from Lawrence's Spring and within 6 mi (10 km) of Wadi Rum Visitor Center and Wadi Rum Protected Area. Khazali Canyon and Mushroom Rock are also within 6 mi (10 km). 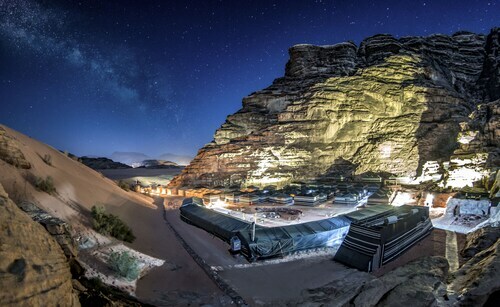 This family-friendly Wadi Rum campground is located in a national park, 11.2 mi (18.1 km) from Wadi Rum Visitor Center, and within 20 mi (32 km) of Wadi Rum Protected Area and Khazali Canyon. Mushroom Rock and Lawrence's Spring are also within 25 mi (40 km).